Welcome to Skatboet (the Nest)! Here you can contemplate nature from a new perspective. 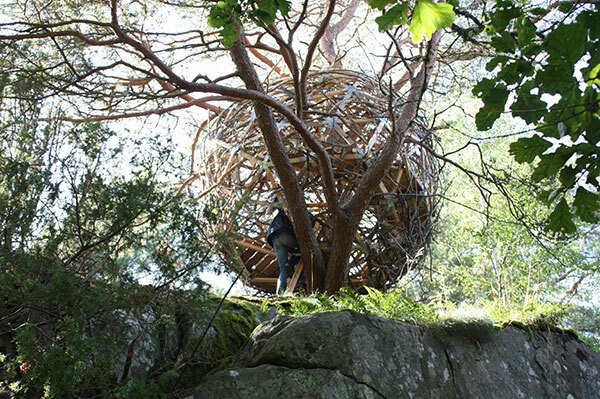 Up in a pine tree on a hill slope near by Prosten Cullberg's road, Särö, Sweden, we have built a spherical treehouse. The geometrical sphere that forms the framework of the nest is constructed out of found sticks from the city (slats of wooden bed frames, chair legs, curtain rods, etc). The construction is hanging in the branches of the tree and has been camouflaged with found sticks from the forest. Together with residents in the immediate area, Färjås Yogaretreats and Släp´s choir, the nest has taken shape in a joint action to collect sticks that have been interlaced into the nest. Inside the nest you find platforms to sit down or you can use the natural branches of the tree to sit on. Here is the opportunity for the visitor to have picnic, contemplate and enjoy the view. Perhaps your thoughts drift away…. and the nest can serve as a model for alternative housing, a utopian vision of living in symbiosis with nature among the trees, like the Baron in the Trees in Italo Calvinos classic novel.